I love books. And the older I get, the more I appreciate them. Nothing beats the feel and smell of a really important old book, especially a first edition. On a table in my office is a facsimile edition of a book that I absolutely relish. Codex Sinaiticus. In terms of calligraphy, it is top-notch. But to most people this book is completely impenetrable. The text is difficult to read, it is written in ancient Greek. However, to those with a knowledge of Christian history it is of immense importance. This “book” called Codex Sinaiticus which literally means something like “the Sinai book” is named after the Monastery of St. Catherine, Sinai where it had been preserved until the middle of the nineteenth century. Technically it isn’t really a book in the way that we think of books. It is a codex. Codices marked a huge transition in book making. The codex is the forerunner to the modern book format. Early Christians rejected individual scrolls and gathered all their texts into one volume which was then rolled over and bound. The codex thus became one of the greatest innovations of its time. This advanced binding technique began the Christian concept of a bible. In some ways, we can thank early Christians for the invention of the book, and Codex Sinaiticus may have been one of the first real books ever produced. My facsimile edition of Codex Sinaiticus is huge, at nearly 800 pages, to me it weighs at least 20 pounds, probably much more. I really can’t emphasize enough its size and weight. 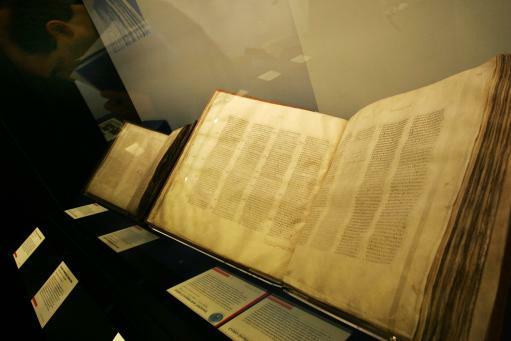 As the world’s “oldest bible” it is obviously of supreme importance in reconstructing the original biblical text. Dating back to the era of Constantine the Great, originally the entire text had about 1460 pages. In present form it includes the complete New Testament, about half of the Hebrew Bible and the Apocrypha as well as two books that didn’t make the later canon cut, the Shepherd of Hermas and Epistle of Barnabas. 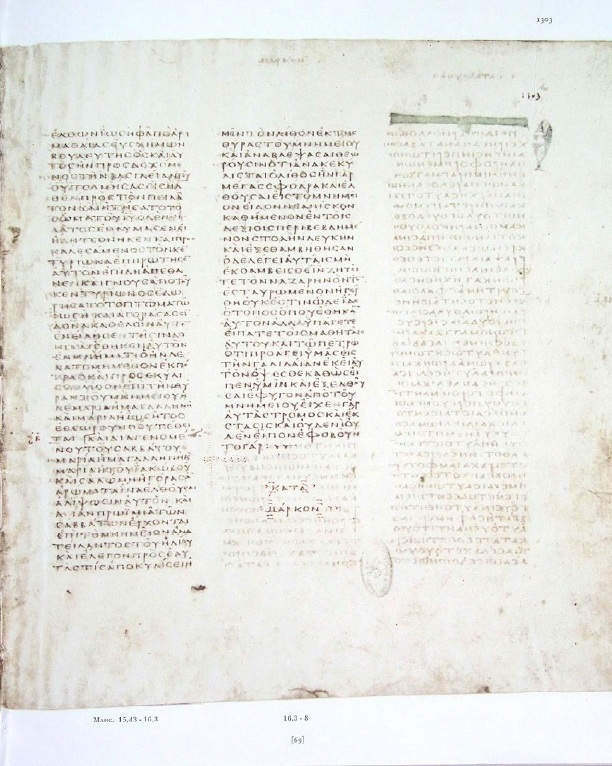 It is speculated by some scholars that Codex Sinaiticus was part of a project ordered by Constantine the Great to produce 50 copies of the bible in 331 A.D. 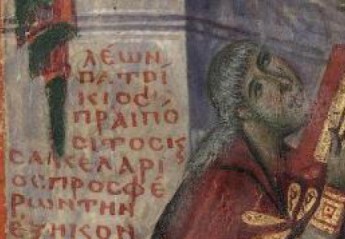 Whether or not it was one of the 50 bibles prepared by Eusebius for Constantine it was nevertheless one of the monastery’s most important possessions. When I have some free time, I love to turn over its huge pages and examine the erasures, corrections and additions. It is written in what is called Greek uncial script (all capital letters). With no spaces between words and all capitals, even with training in Greek it takes a bit of getting used to. It wasn’t until hundreds of years after Codex Sinaiticus was composed in the three hundreds A. D. that cursive lower case Greek manuscripts began to emerge. It is thought that between the 4th and 12th century later monks corrected what had been written by earlier scribes in Codex Sinaiticus. Hence, there are estimated to be about 27,000 total corrections to the text. Some readings have theological significance such as the early ending of Mark (in Codex Sinaiticus Mark ends at 16:8, scholars continue to debate whether verses 9-20 are therefore unoriginal). The possibility of these verses in our earliest gospel not being inspired should cause even an amateur reader of the bible to pause and ponder the theological significance. Codex Vaticanus has been housed at the Vatican library since the 15th century and it is speculated that Vaticanus and Sinaiticus were both part of the project (mentioned above) by Constantine the Great in 331 A.D. to produce bibles for the Bishop of Constantinople. But only Sinaiticus contains the complete New Testament. It is interesting that there is a blank column after Mark 16:8 in Codex Vaticanus which indicates that the scribe did not consider the longer ending as part of scripture, but it also tends to prove that he was aware that some sort of longer ending existed. As I have leafed through Sinaiticus, what has struck me is how fluid the text may have been to early scribes. Some changes are indeed significant and scripture as it has come down to us over the centuries was transmitted by humans, clearly by very human hands. If I look closely I can even distinguish different handwriting styles (there are said to be four main scribes). After more than 1600 years of wear and tear the script is still, however, said to be priceless. 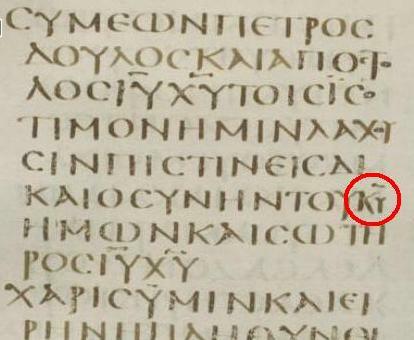 In this picture the circled Greek letters that look like “KY” are a nomen sacrum for the Greek word kyrios (“lord”). In most new testament texts, scribes would typically use a nomen sacrum for God, Lord, Jesus Christ and possibly Spirit. The four divine names. But in addition to the four divine names, the book of Revelation in Sinaiticus also includes terms such as heaven, man, son, father, omega, Israel and Jerusalem as nomina sacra. Why? I don’t know. In addition to the creative use of nomina sacra in the Apocalypse contained in Sinaiticus there is also the striking use of many substituted terms. “Saints” replaces “servants” in Rev. 1:1; “island” is replaced with “valley” in Rev. 6:14; in Rev. 4:3 “rainbow” is changed to “priests” and “rainbow” is changed to “hair” in Rev. 10:1. Why? Again I do not know. There are lots of other variants in the book of Revelation I have observed in Sinaiticus. Exactly when they were introduced, why they were introduced and the thinking behind the many, many intriguing readings remains a mystery.